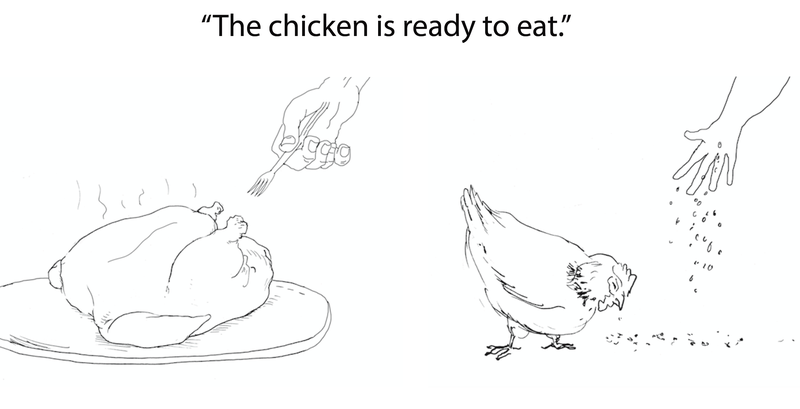 ‘The Chicken is Ready to Eat’ has two meanings. A new study shows how your neurons decide. Sensory information flowing into our brains is inherently ambiguous. We perceive 3D despite having only 2D images on our retinas. It’s an illusion. A sunburn on our face can feel weirdly cool. Illusion. A little perfume smells good but too much is obnoxious. Also an illusion. The brain expends a great deal of effort to disambiguate the meaning of each incoming signal—often using context as a clue—but the neural mechanisms of these abilities remain mysterious. Neuroscientists are a little closer to understanding how to study these mechanisms, thanks to a new study by Kevin Ortego, Michael Pitts, & Enriqueta Canseco-Gonzalez from Pitts's lab at Reed College, presented at the 2018 Society for Neuroscience meeting, on the brain's responses to both visual and language illusions. Illusions are experiences in which the physical reality is different from our perception or expectation. Ambiguous stimuli are important tools to science because the physical reality can legitimately be interpreted in more than one way. 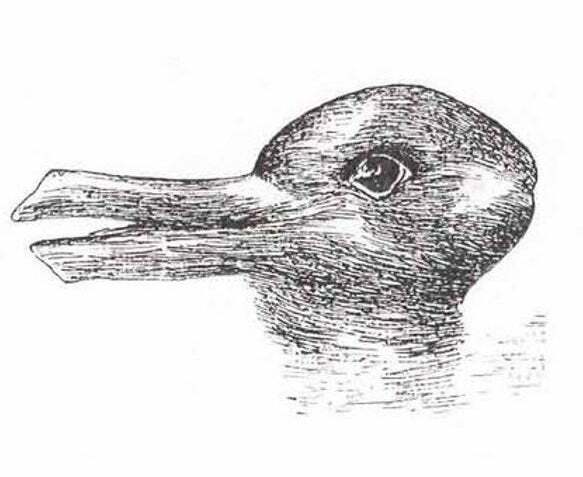 Take the classic rabbit-duck illusion, published by the Fliegende Blätter magazine, in Münich, at the end of the 19th century, in which the image can be seen as either a duck or a rabbit. Bistable illusions like these can flip back and forth between competing interpretations, but one cannot see both percepts at the same time. Recent examples of ambiguous illusions show that numerous interpretations are possible. The first place winner of this year's Best Illusion of the Year Contest, created by from Kokichi Sugihara, shows three different ways of perceiving the same object, depending on your specific vantage point. But what happens in the brain when a bistable stimulus like the rabbit-duck figure flips from one state to the other, without the observer changing their vantage point? Neuroscientists have previously shown that the brain's electrical signals belie a specific detectable signal from within the visual cortex, whenever the percept flips from one to the other. Ortego and his colleagues have now discovered that a very similar neural signature also occurs when ambiguous sentences flip. Ortego and his collaborators first presented ambiguous images to human participants wearing electroencephalographic equipment capable of detecting the "flip" signature from the visual cortex. Then, they showed them either visual or linguistic bistable stimuli. None of the stimuli changed physically, but the scientists presented, shortly after that, a disambiguating clue that forced one or the other of the possible interpretations within the subjects' mind. Finally, the team asked participants whether the stimulus had flipped, or not. See the sequence below. Depending on each participant's initial percept, the sentence's meaning either did or did not flip when the scientists presented the disambiguating stimulus. During “Visual Trials,” Ortego and colleagues detected the “flip” neural signature when participants reported that the visual stimulus had flipped, as expected from prior research. Then the scientists also analyzed the “Sentence Trials,” and they found that, when participants reported that the sentence had flipped, the same “flip” neural signature appeared, but now in the frontal lobes of the brain, and found that their combined results indicate a common neural circuit involved in the disambiguation of bistable syntax and bistable vision, residing in at least two parts of the brain. Future research could find an analogous signature in other parts of the brain still, perhaps related to the meaning of other types of perception and cognition. If that’s the case, neuroscience may have a new and important tool to help determine how our brain extracts meaning.